After the 2003 “Rose Revolution” in Georgia, the school became an independent organization. The process of decentralization started actively in the education system. The Board of Trustees (BoT) were established in schools. According to the Law on General Education the members of BoT have the right to elect the school principal. The members of the BoT are elected teachers, parents, and school students. The school principal managed the school independently from the Ministry of Education according to the legislation. The implementation of such reforms was necessary to equip the board members and school principals with appropriate knowledge and skills. The State has taken steps in this direction and started training of School Directors and Board of Trustees. In 2004-2007, state policy was directed towards maximum decentralization, schools independently solved manuals, professional development, self-government, financial and other issues. But the system soon began to turn toward centralized governance. The control of schools was particularly strong in the years 2010-2012. In 2010 the Ministry of Education issued the special decree that the public schools were not permitted to collaborate with NGOs, Universities without the permission on Ministry. In fact schools have been closed to many organizations (including universities) who have been working in the field of education for years and have contributed to the development of educational system in Georgia. The situation has changed nowadays, but the issue of schools' broad autonomy is an issue of discussion of the educational community. It is necessary to raise the public awareness about the democratic principles of school management. In 2016, within the project "Democracy Schools", school democracy standards were developed by the support of Polish Solidarity Foundation. In the development of standard 30 public schools, professors and educators participated. In the frames of "CNC advocacy actions 2018". 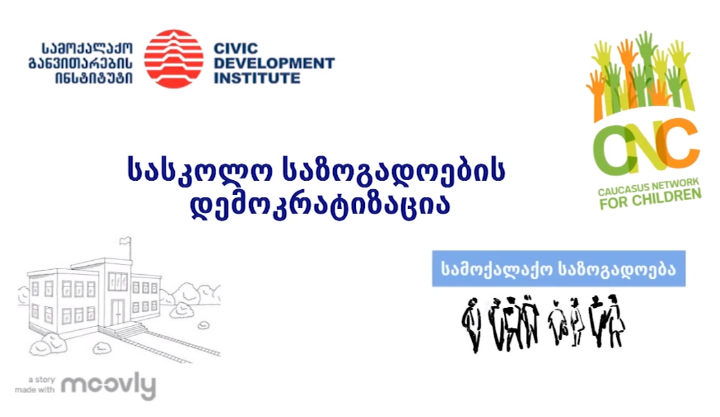 In addition, "Civil Development Institute" (CDI) has produced three videos on school environment, school management and teaching and learning. In a clear and simple language videos help the audience to realize the importance of democracy in schools, child friendly environment, tolerance, inclusiveness and safety.